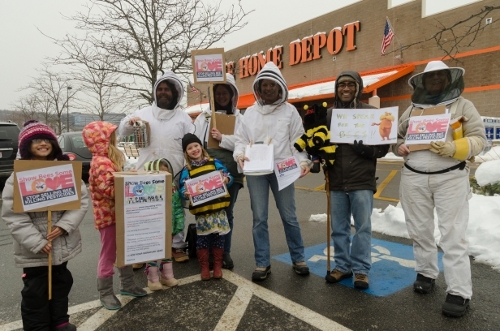 On February 15, beekeepers and friends of bees (and food) delivered over one hundred signatures to the managers of the Home Depots in Natick and Waltham and of the Lowe’s in Framingham, asking that the stores“Show Bees Some Love” by removing bee-killing pesticides and plants from their shelves. These friendly protests were part of the Bee Week of Action taking place all over the US, with over 27,000 people delivering more than half a million petition signatures to Home Depot and Lowe’s. It was organized by Friends of the Earth (www.foe.org) with many partners, the most local of which was the BEElieve beekeepers group, based in Wayland. A growing body of science has implicated neonicotinoids (“neonics”) – the most widely used class of insecticides in the world — as a key factor in global bee deaths. The European Union’s two-year ban on the most widely used neonics went into effect in December. In January, the European Food Safety Authority cited evidence that two neonicotinoids (acetamiprid and imadacloprid) may affect the developing human nervous system of children, and they recommended further restricting their use. But in the States, the EPA has delayed action on neonicotinoid pesticides until 2018. The shelves of the largest retailers, Home Depot and Lowe’s, are lined with these pesticides. Moreover, a study released last summer (Gardeners Beware) found that even so-called “bee-friendly” garden plants sold at the stores are pretreated with them, without warning to customers. But Home Depot, at least, seems to be listening. To date, Lowe’s has not made any public statements or responded to meeting requests by Friends of the Earth. “Concerned customers can keep demanding of nurseries and garden centers to stop selling these pesticides and to offer third-party certified organic starts and plants,” said Vander Straeten. More information about neonics and which names they go under can be found at www.beyondpesticides.org/pollinators/chemicals.php.